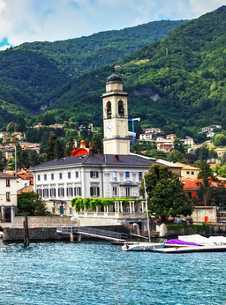 The Romanesque church was rebuilt between 1758 and 1775 and consecrated by Bishop Mugiasca. 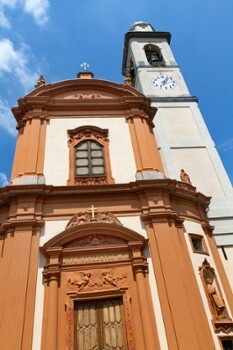 The red and white facade in Baroque style was built in 1861 thanks to the efforts and donations of Monsignor Gianorini, resident in Cernobbio. The interior of the church is structured with a single nave, has two side altars in marble. 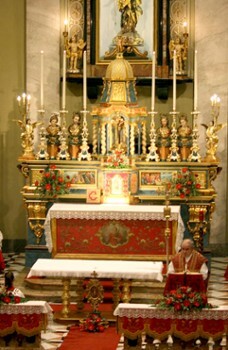 On the right altar there is a statue of Our Lady of Sorrows, the left one is dominated by a beautiful wooden statue depicting Santa Marta; the portal side niches house two statues of St. Constantine and St. Hippolytus. On the vault of the church, frescoed by the painters Lietti and Torildo Conconi, are depicted a Glory of Angels and the Four Evangelists, on the side walls there are frescoes of the life of St. Laurence and St. Vincent. The gilded wooden altar is a copy of the valuable work destroyed in a fire in 1978, the organ (Bernasconi) is placed in the counter of the church, at the back of the nave we find the statues of St. Ambrose of St. Abbundius and dating to 1863. Worth of note is the beautiful Processional Cross of 1500, a masterpiece of the goldsmith's art of Francesco Ser Gregorio. 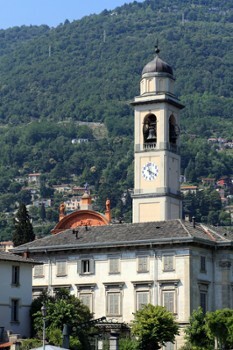 Since 1935 the church of St. Vincent ceased its role as a parish church in Cernobbio, in its place now there is the new church of the Most Holy Redeemer. In 2005, with a valuable work of restoration have been restored the bell tower, the vault and the facade. Nearby Things to Do include: Towns such as Blevio and Moltrasio; Water Activities such as Non Solo Barche Boat Rental and Lido di Cernobbio; Monuments such as Volta Lighthouse and Life Electric; Villas such as Villa Allamel and Villa Erba; Parks & Gardens such as Garden in the Valley and Villa Pizzo Gardens; Churches such as Santissimo Redentore and Santi Epimaco e Gordiano.